What is a Dog Expert Witness? A Dog Expert Witness is a person used to explain anything within their area of expertise to the courts. They can be instructed by the prosecution or defence but must remain independent, truthful and impartial, with their duty being to the court or tribunal - not the person instructing them. A Dog Bite Expert Witness needs to have a comprehensive understanding of their field, with a combination of experience, qualifications and confidence in order to advise the court with all issues regarding dogs and their behaviour. As an Expert Witness in dog behaviour cases, my role is to support you and your dog through the legal process for the best possible outcome. If your dog has bitten (or alleged to have bitten) a person whilst out in public or on your property, or if your dog has been seized under the Dangerous Dog Act, I can provide you with a dog behaviour assessment, breed type identification and appearance in court as an expert witness for dogs. I have a proven track record of saving dogs from destruction. Please take a look at my testimonials from previous clients further down this page. What Skills Are Required as a Dog Expert Witness? A variety of skills are required to work as a dog expert witness, and these include the ability to objectively assess a dog, its owner and their ability to safely manage the dog in and out of the home. These professional skills then extend to the ability to create a clear report that fulfils legal guidelines and to provide the end report within an agreed timeframe or to meet a set deadline. Furthermore, a dog expert witness needs to be able to provide evidence in the courtroom, so as to assist the court in reaching a decision based on the facts provided to them. Why Choose Me as a Dog Expert Witness? I have worked as a successful full-time dog behaviour specialist for over 15 years and in that time I have carried out in excess of two thousand consultations covering all aspects of dog behaviour across a wide range of dog breeds. I resolve cases of aggression to dogs and aggression to people on a daily basis, which provides me with a great deal of practical, hands-on experience in relation to conducting in-depth assessments on any breed of dog. It is not just cases of aggression to dogs and people that provide my experience, but dealing with other cases such as predatory chasing, barking, and dealing with various fears and phobias in dogs, separation anxiety, recall problems and safety with children and dogs. As an ex-police officer, I am capable of formally assessing and compiling evidence, creating clear, professional reports and offering expert opinion in Magistrate and Crown Courts whilst remaining calm, confident and professional when under questioning. I have acted as a dog expert witness following instructions by Clients, Solicitors, Police Forces, Welfare Organisations, Child Adoption and Fostering Agencies and Courts. I always work in close co-operation with police dog legislation officers (DLO’s) and legal professionals, bringing a professional yet practical spirit to my work. I have provided numerous dog assessments for social services, fostering and adoption organisations. I welcome contact should you require an experienced and professional assessment of an existing dog within a household or prior to placing the child into a home. As a dog expert witness, I have worked with many police forces throughout the country such as West Midlands, West Mercia, Gloucestershire, City of London, Thames Valley, Essex, Avon and Somerset, South Wales, Dyfed Powys, West Yorkshire, Surrey, Metropolitan, Greater Manchester, Derbyshire, Devon & Cornwall, Lancashire. PSNI - Northern Ireland, Northumbria, Cambridgeshire and Hertfordshire. I have a Master’s degree in dog behaviour from Middlesex University (Professional Practice in Canine Behaviour and Psychology). I undertake ongoing training courses to ensure I remain up-to-date with current dog legislation. I am a full member of the CFBA, The UK’s leading dog behaviour association. I have a sales background in compiling and delivering professional presentations under pressure. I am confident when speaking in a formal environment and most importantly I have a passion for what I do and supporting people and their dogs through the legal process with care remains very important to me. When dealing directly with private clients, I am fully aware that you, the owner, will be experiencing high levels of stress and anxiety when your dog has bitten a person, alleged to have bitten a person, or worse still, your dog has been removed from you as a result of the incident, or it is suspected of being a banned breed and taken into police custody. Having dealt with such situations many times previously, I will be able to calmly guide you through the various steps needed for the best possible outcome. You or your solicitor will contact me and provide me with a summary of information regarding the case. Where required, I will provide initial advice for the best course of action to follow. I will submit my fees for approval (for both private and Legal Aid funded cases). I have a good understanding of working within the parameters of the Legal Aid Agency and will provide a detailed quotation. Your solicitor will send me written legal instructions, together with all evidence relating to the case, which could be photos, video, medical reports, character references for the dog and witness statements. I undertake an assessment of your dog in the home, in public environments, or in secure police compounds or dog kennels by arrangement with the relevant police force and a dog legislation officer. This can be a temperament assessment and or a breed type identification. When assessing a dog from the home, I will provide suitable advice to ensure the immediate and on-going safety to members of the public and where appropriate further advice on how to improve various dog behaviours problems pertaining to the case. I provide a full written report combined with a high-quality DVD reflecting my experience and time with the dog and owner. This method of evidence submission has proven to be highly successful and persuasive in court; avoiding destruction of the dog in the vast majority of cases. As a point of contact, I liaise with the police, solicitors and the owner, so as to bring together all the relevant points in the defence of the dog and owner. If the case goes to court, I attend as a Dog Expert Witness and give evidence in support of the written report and DVD provided. There is a significant amount of legislation that can apply to dogs in the UK, and the most important, The Dangerous Dogs Act, 1991, was extended in May 2014 to cover attacks by your dog on private property and assistance dogs. These laws are designed to protect us, but they do mean that there are a number of ways that your dog could commit an offence. I will give a very brief interpretation of the main acts, but I have also included a link to the UK Government website for a full explanation. I have also written an in-depth article that looks at Dogs and the Law in the UK, which can be read here. This is designed to increase awareness of all the laws that can pertain to the average dog owner. The Dangerous Dogs (Amendment) Act 1997 changed the mandatory ruling that all banned breeds should be automatically destroyed with the introduction of an Index of Exempted Dogs (IED), for dogs from the banned list that do not pose a risk to the public with a suitable owner. Offences under Section 1 of the Dangerous Dogs Act 1991 are conducted in a Magistrates Court. The Court will decide, based on the evidence provided, whether your dog is of “type” or having the characteristics of a banned breed. It will also make a judgement on whether you are a suitable owner of your dog and if the answer is yes to both these questions, they will make a contingent destruction order allowing your dog to return home subject to conditions, mainly that of the muzzling and keeping the dog on a short lead in public and third-party insurance, registration on the index of Exempted Dogs, micro-chipping, neuter, walked by an adult (16yrs and above) and the full securing of your house and garden. If you do not follow these conditions, it could lead to prosecution and the seizing of your dog. Offences under the Dangerous Dogs Act, section 1, carry a maximum sentence of 6 months imprisonment. The police have the power to issue an interim exemption pending the court's decision. Forces can vary in their approach to the interim exemption scheme and can exercise discretion. This can avoid a dog that appears to be 'of type' being kept in kennels for long periods and avoid the negative effect of being kept away from its owner. It is a criminal offence for the owner, or the person in charge of a dog, to allow that dog to be “dangerously out of control.” This could be a dog that injures a person, or a dog that behaves in a way that causes reasonable fear in a person that it may injure them. If your dog is dangerously out of control, it could be seized by police and it may be destroyed unless the court can be convinced that it will be of no further danger to the public. Your dog may be subject to a control order and you may be subject to a prison sentence, a ban on keeping dogs, a fine and you may have to pay compensation to the victim. The extension of section 3 of the Dangerous Dog Act 1991 to cover incidents that take place on private property. Local Authorities can issue “Public Spaces Protection Orders” to prevent incidences of dog aggression. Removal of the necessity for police to seize dogs of the banned breed type if they are not considered to be of risk to the public. This section enables civil proceedings to be taken against an owner with a dog that is dangerous and not under control. This behaviour can be directed towards a person or an animal and is applicable both in public and private locations. The court can order the owner to pay costs for the proceedings, make sure that the dog is kept under appropriate control or for the dog to be destroyed. As a result of the extension to the Dangerous Dogs Act 1991 in 2014, it is clear that the Dogs Act, section 2 is less likely to be used. It is an offence to allow your dog to worry, chase or attack, livestock on agricultural land. The farmer is allowed to protect his animals and this protection could extend to shooting your dog. The police can seize your dog and although the maximum penalty is a fine, a conviction can lead to your dog being destroyed under the Dangerous Dogs Act, section 2. This act introduced more stringent penalties for acts of cruelty such as dog fighting, mutilation or neglect. Prosecutions are often made by the RSPCA and if convicted the maximum sentence can be 6 months imprisonment or a fine of £5000. When travelling in vehicles, dogs should be safe and secure so that they are not of distraction to the driver in any manner. Every dog must be microchipped in England, Scotland, Wales and Northern Ireland. All dogs need to be microchipped by the age of eight weeks old and registered with a database. Breeders will need to microchip their puppies and register themselves as the first keeper of the dog before they are sold to their first new owner. Whilst barking is a natural behaviour for dogs, a nuisance level of barking can lead to your neighbours making a complaint to their local authority which could lead to you being served with an abatement notice, (a notice requesting that they cease the noise). If the measures taken to control your dogs barking don’t work, you could be prosecuted under the Environmental Protection Act 1990, resulting in a potentially heavy fine and legal expenses. This Order means that all dogs must wear a collar with the name and address of its owner engraved on it or on a tag. Your telephone number is optional. This act says that failure to adhere to a Dog Control Order could mean a fine of up to £1000. These Dog Control Orders would apply to various issues such as not picking up your dog’s faeces, failure to keeping your dog on a lead where directed to do so and allowing your dog onto land from which they are excluded. 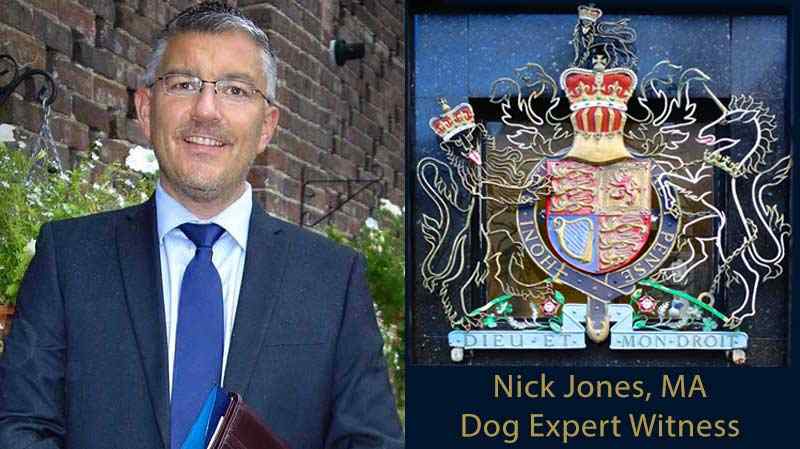 “I have used Nick Jones as a Dog Expert Witness of Alpha Dog Behaviour Ltd on a few occasions now and he provides a thorough and timely report. I have used him to assess the dangerousness of dogs and to assess a dog's “type”. The service he provides is first class and I will certainly use his services again. Keep up the great work Nick." Dan Heard - Solicitor-Advocate. Goldstones Solicitors. Swansea. "We recently engaged Nick to act as an expert witness in a court case. We found him to be extremely knowledgeable and helpful. The advice he gave, both in respect to the case and relating to our dog's behaviour, was very useful. Highly recommended." "Mr. Jones provided a fast and efficient service as a dangerous dog assessor. He is very easy to communicate with and gained an instant rapport with my client. His expertise is clearly evident and he is rigorous in his approach. It was my pleasure to work with you. Best wishes, Julian." Julian Berg - Consultant Solicitor - Cox Burley Solicitors. Cornwall. "We confirm that at Court on 5 June 2018, your report upon the behaviour of our client’s dog was instrumental in securing a Contingent Destruction Order instead of an immediate destruction order. Many thanks for your help with this matter." Chris Johnson - Mosshaselhurst Solicitors. Cheshire. "Many thanks to Dog Expert Witness Nick Jones of Alpha Dog Behaviour Ltd, who handled the case very professionally and dealt with all the problems that arose with efficiency." Thomas Woodward - Norris, Waite & Slater. Sheffield. "I am Hayley Cutler, a Criminal Solicitor based in Leeds. I was instructed to deal with a case where a client’s dog had bitten a child. My client was advised in relation to the strength of the evidence and in this case a guilty plea was appropriate. When we proceeded to sentence the Crown Prosecution Service applied to the Court for destruction of the dog. I offered mitigation on behalf of my client and asked for the opportunity to obtain a report from a dog behaviourist. A full assessment of the dog had to be conducted in order to assess, firstly whether the dog appeared aggressive and if any risk to the public could be eliminated with conditions. I sought the services of Dog Expert Witness Nick Jones to conduct the assessment and prepare the report for the Court. The Police seized the dog. Nick was able to liaise with the Police and arrange to attend and conduct the assessment. A full report was prepared to assist the Court when determining whether the dog should be destroyed. The report was helpfully accompanied by a DVD, which showed the assessment being carried out. The report was very thorough and dealt with a variety of instances, where which may attract an aggressive response from the dog. I am pleased to say that throughout the whole assessment the dog did not demonstrate any aggression. At all times Nick remained professional and the DVD reflected this. The report set out a number of recommendations to the Court. I am delighted to confirm that with mitigation the Court were persuaded that the dog did not need to be destroyed and made a suspended indefinite order incorporating the conditions proposed by the dog expert witness, Nick Jones." Hayley Cutler. Criminal Solicitor. LM Law. Leeds. “I am a Criminal Defence Solicitor with a firm in Leeds and I was instructed in early-mid 2014 on a matter involving a Bull Mastiff said to have bitten a woman (e.g. dangerously out of control in a public place). The matters were complicated by the fact that the dog had been made subject to a control order to keep it on a fixed lead and muzzled in a public place in 2011 by the same court, which had been disobeyed by the defendant. There was a further offence subsequent to the more serious offence where the dog was again said to be un-muzzled in public, meaning the client had an uphill battle. He pleaded guilty to the offences and was given a community order, but the District Judge made an immediate destruction order against the animal. This element of the sentence was appealed and upon a recommendation from a fellow lawyer I instructed dog expert witness, Mr. Nick Jones, who subsequently attended at the police kennels on two occasions (navigating a wall of police bureaucracy in doing so) was eventually able to complete a positive assessment of the dog in a controlled environment, also producing a report and DVD for the appeal. After several hearings at the Crown Court the matter was eventually ruled upon favourably and the Dog re-homed with a third party, which Mr. Jones facilitated. The defendant was not made subject to a banning order personally, and so the outcome was excellent under the circumstances. I am certain that without the expertise of Mr. Jones the dog would have been destroyed and indeed my client would have been made subject to a more onerous order probably banning him from the ownership of other animals." Joseph Nahal-Macdonald. Criminal Defence Solicitor. Leeds. "Dog Behaviourist Nick Jones completes independent dog assessments for our prospective foster carers where applicants have large or boisterous dogs, or dogs that raise any concerns in regard to their reactions around young people. Nick is extremely knowledgeable about what an agency requires in regard to report writing and has presented well at the visits he has undertaken for our agency. The reports received have always been extremely well written and go above and beyond our expectations, ensuring all eventualities are covered well. Alongside this, Nick has been extremely flexible and has provided all reports in a timely manner." Jennifer Dear. National Panel Coordinator. Advanced Foster Care. Birmingham. "My name is Sue Clayton and I am a Foster Carer. Advanced Foster Care used Nick Jones to assess our two English Bull Terriers Poppy and Elsa. Nick put my mind at rest immediately. After assessing our dogs, not only did he assure me that the dogs were affectionate and safe with children, he noticed that Elsa had a rash and Poppy had sore patches under her front legs and chews her paws a lot. Nick thought it was a wheat allergy. He gave me a list of food that did not contain wheat and I bought it straight away. I am pleased to say the rashes have cleared up and Poppy no longer chews her paws. I found Nick to be extremely professional and highly recommend his service." Sue Clayton. Foster Carer. Worcester. 1. What should I do if my dog has bitten someone on the home property or in public? Firstly, try not to panic. Apart from taking the obvious steps at the time of the bite to administer first aid to the injured person, securing your dog and to declare the offence to the police, let’s calmly look at the next steps together. I am often told by owners of a dog that has bitten, that the injured party did not want to press charges, as they felt they did something wrong themselves to bring about the bite, or that they simply did not want to get the dog or owner into trouble unnecessarily. On the other hand, there are many members of the public that will respond to the slightest hint of aggressive behaviour towards them, with reports to the authorities and you may even find yourself the subject of verbal abuse at the time of the bite. Awareness of the Dangerous Dogs Act and some people’s readiness to pursue damages is greater than ever, so do your research as soon as you find yourself in this situation, so that you are being given clear and balanced advice on what to do next. Many people do not realise that in 2014 the home property is now included under the Dangerous Dogs Act legislation and so people who are bitten on your property will come under that act. I have no financial relationship with them, but a very good first port of call would be to contact Cooper & Co. Solicitors at www.doglaw.co.uk to obtain initial legal advice, as I take part of my own continuous professional development from them in lectures and know them to be highly professional and helpful. 2. Should I muzzle my dog in public? If your dog has previously bitten a person or dog, or if you believe that behaviour is being shown that would lead you to believe that your dog may bite in the future, then I advise you to introduce and use a muzzle, yes. The best muzzle for most dogs is the Baskerville Ultra and can be seen here on Amazon. With my dog behaviourist hat on, I would encourage you to take steps to contact me, so that we can look at this behaviour ahead of time to avert disaster in the first place. Prevention is always better than cure. In dog behaviour cases I would always look ahead to a time when the dog is safe and calm and that we could consider removing the muzzle at a later stage when safe to do so. Each case should be judged on its own merits. Please bear in mind that many cases of dogs that have lunged at, nipped or bitten a person end as a Contingent Destruction Order and that the bottom line is that you will have to muzzle your dog and keep it on a short lead in public. This outcome is on the assumption that the owner can demonstrate adequate control of the dog during a dog behaviour assessment in public and that the dog is not a risk to the public as it is exercised. Remember, it can take just one excitable yet unfortunate jump up at a person, and a grabbing of the sleeve that unintentionally bruises the arm and you have everything in place for a lot of upset for all parties concerned. This is a classic example of a dog that would generally expect to assess well, yet end as a contingent destruction order whereby a muzzle and lead would be required to satisfy the court that the dog is safe in public places. There is no such thing as being allowed one bite before steps are taken. Destruction Order: When the court decides that your dog should be destroyed. 3. If my dog bites someone will it be put to sleep? Not necessarily, no. I have had many conversations with owners of dogs that have bitten and fear that the police will automatically remove their dog from the home and be destroyed. Assuming that the event was reported to the police by the injured party, it is likely that a police officer or Dog Legislation Officer will attend your home address to make an initial assessment upon the dog. Depending on various factors such as the police force involved, the breed (or suspected breed) of the dog, the dog’s behaviour towards the attending officer, the severity of the bite, any previous aggressive history from the dog and you as an owner, the dog may be seized or be allowed to remain with you as proceedings take place on a legal level. I have been involved in some dog bite cases whereby a report of a bite has been made, but the police had not attended the home at all, but this is rare. If your dog is seized and does not assess well in police kennels with the dangerous dog expert, the dog is overtly aggressive to people and it is clear that you as an owner fall short in terms of your ability to manage the dog in and out of the home, then you may be looking at a less than positive outcome. Remember every single case is assessed on its own merits, and the vast majority of otherwise well-balanced dogs with law-abiding, caring owners will not have their dogs destroyed. Although I speak generally, most dogs involved with the Dangerous Dogs Act will have never shown aggressive behaviour before and are unlikely to do so again and so these dogs are not likely to be destroyed. Before I finish this subject, allow me to address another element, which is the subject that sometimes arises of when the owner decides that if their dog bites another person, it should be taken to the vets without hesitation, and put to sleep there and then. I realise the decision will depend on the dog’s nature, history and the severity of the bite or dog attack, but such a response is in most cases is unnecessary and so I encourage the owner to take stock as emotions return to normal and that various enquiries can be made in terms of behaviour adjustment, combined with suitable methods of management. Before such dramatic measures are taken, I think we owe it to the dog to be sure that everything was done before we quickly opt to destroy the dog. 4. If my dog bites someone, will the police seize my dog? Much of this was addressed in number 3 above, ‘If my dog bites someone will it be put to sleep?’ but it is still worthy of further clarification. Different police forces can have varying approaches and in some instances, the force may not have the resources to remove the dog and kennel it, so that alone may affect what the police do. As a result, it is hard to give a definitive ‘Yes’ or ‘No’ to this question. Let’s assume for a moment that you live in an area where the police have good resources, and then if the police believe your dog could be of a Pit bull type or any other of the banned breeds, then yes, your dog will be seized, assessed and processed through the courts. If you own a dog that may have simply scratched a person and it is clear that the dog is friendly enough in the home and under control, then the dog is unlikely to be removed from the home and stays with the owner pending the outcome of the proceedings. I wish I could be more definitive in answering this question, but I have seen so many variations that it’s hard to second guess what the outcome will be, but we can generalise to a degree. However, if the police feel that the dog is an on-going risk to the public, and then it is likely to be seized. 5. My dog has been accused of biting someone, what should I do? This question suggests that you did not witness the incident yourself, or that you disagree with the accuser. A civil or criminal prosecution may be actioned against you as the dog’s owner and you should contact a solicitor who specialises in dog law to help you defend you and your dog. Your solicitor is likely to seek the help of a Dog Expert Witness who is able to give an objective assessment of your dog’s behaviour, whether your dog has the characteristics of a banned breed type and address issues such as the bite size of your dog to compare against photographic evidence for example. You may be able to find an objective witness to the incident, but avoid the use of social media platforms. It can also be helpful to gather relevant testimonials about the good behaviour of your dog from neighbours, your vet, other dog walkers, or people who deliver to your home etc. It would be worth mentioning here that with the extension of the Dangerous Dogs Act in 2014, you can be prosecuted for incidents that take place on your own property, as well as in a public environment away from the home. Whilst it is not always easy, a reasonable conversation with the person accusing your dog of biting at the time of the incident can prevent legal proceedings. Showing that you are taking the matter seriously whilst not conceding that your dog has bitten if you don’t think it did, could defuse matters and help make the other party feel less likely to pursue the matter legally. Make sure that you keep calm and keep the safety of your dog and people in the area of the incident as your first priority. 6. Is my dog an illegal breed? If you suspect that your exhibits characteristics of one of the four banned breeds in the UK: (Pit bull terrier, Dogo Argentino, Japanese Tosa, Fila Braziliero), then you would be best advised to speak with your local Police Dog Legislation Officer, as there is a reasonably good chance that you will be able to register the dog on the Index of Exempted Dogs (IED), though the dog may be removed from the home whilst dog breed assessments are carried out by the police and a dog behaviour expert witness. Once a dog breed type assessment has been carried out and your dog is found to have characteristics of a banned breed and the court decides that you are a fit person to keep the dog, you will be responsible for the cost of its registration onto the IED (£92.40 as of July 2018). You will have two months after the hearing to place your dog on this register. You are also liable for kennelling fees incurred whilst your dog has been kennelled. You will need to neuter your dog, microchip and insure it for third party liability with Brooks Braithwaite or the Dogs Trust. Once the dog is back in your care, you will need to keep it on a lead and muzzled in public (which includes a motor vehicle if it’s in a public place) and not walked by anyone under the age of 16. Give away a banned dog. You will need to ensure that your home and garden are safe and secure so that the dog cannot escape. The third-party liability will need to be renewed each year. Defaulters of the IED are reported to the police. If you or another person who has charge of the dog fails to carry out the above measures, it will be seen as a breach of the exemption conditions and your dog will be regarded as unlawful and will have committed further offences. This can lead to the dog being seized, the issuing of fresh criminal proceedings and the prospect of the dog being destroyed. 7. My neighbour threatens to report my dog, as he is scared that my dog will bite his small children. Should I be concerned? An interesting element of the Dangerous Dogs Act is that your dog does not need to bite to commit an offence under the act. It is a criminal offence for the owner, or the person in charge of a dog, to allow that dog to be ‘Dangerously out of control’ in a public place. This could be a dog that injures a person, or a dog that behaves in a way that causes reasonable fear in a person that it may injure them. So given the above aspect of the Dangerous Dogs Act, IF you believe that your dog may indeed be displaying behaviour that would give rise to a genuine concern to another person, I encourage you to secure your dog so that such apprehension does not continue. This could be overcome by addressing the fencing between you if the problem exists there, or to seek out some specialised advice from a dangerous dog expert that can carry out a dog behaviour assessment and offer you advice to modify your dog’s behaviour. Look at this government web link regarding 'Controlling your dog in public'. 8. What are the legal obligations I need to consider when buying a dog? Whilst you are not obligated to insure your dog, I would advise that you do take out a third party insurance policy (I recommend Petplan) at a minimum, as this will provide cover for unforeseen events such as accidents caused, damage to people or property, costs awarded against you in court and legal costs and expenses involved in defending a claim. Your dog will need to wear a collar with its name and address of the owner when in public. It would also be prudent to register your dog with your local veterinary practice as soon as you are able. As of April 2016, it is compulsory to microchip your dog. 9. What are some of the best safety practices when taking my dog out in public? Does not jump at people in public. Does not display aggressive behaviour or even bark at people and objects in public. Does not ignore you when it is called under various circumstances. Does not lunge at people or dogs when approached. Does not chase people, objects or other animals. Whilst not exhaustive, these are some of the main dog behaviour problems that you could experience with your dog that may cause you issues regarding various dog laws. If you are experiencing any of these problems then please contact me for further help, but in the short term the above areas of concern can be addressed with a combination of the use of an appropriate muzzle, a short lead when walking in public or in the home and a long training line in large open spaces. Please note that The Control of Dogs Order 1992 states that any dog in a public place must wear a collar with the name and address of the owner engraved or written on it, or engraved on a tag. Your phone number is optional. 10. Will my dog be put to sleep if I lose my case in court? The answer varies based on whether we are looking at a banned breed (see the list in question 6) or a dog of another breed. If your dog is not a banned breed, but injures another person and then fails an assessment that is carried out by a dangerous dog expert, then it is quite possible that a recommendation will be made to have the dog destroyed so as to protect the public. A number of dogs may pass the assessment, but small reservations may exist. This may relate to areas of training for both the owner and dog, so that (for example) the dog does not pull in public, bark at traffic or passers-by. Assessments are not always so black and white in terms of ‘Pass’ or ‘Fail’, and so it’s not unusual for me to make further recommendations in my dog behaviour assessment report, as a dog’s behaviour is usually quite malleable and can respond well to retraining in the right hands. 11. What happens to my dog when it is in police kennels? If the dog in the kennel was brought in due to an aggravated offence (injury to a person), very often the staff are not allowed to remove the dog from the kennel and walk it for safety and insurance reasons, and so it can be a fact that some dogs are simply moved from one end of the kennel to another, depending on whether the staff are cleaning out the kennel or feeding the dog. Most kennels build to a formula, whereby the space is long and narrow. One smaller end is for sleeping and the other bigger end allows the dog into the main run, usually with a drop hatch that separates the two parts when needed. So, imagine a long rectangle, with a quarter set aside for sleeping space and the other three quarters there for toileting and exercise. The run is approximately five feet wide by 20 feet long. In terms of handling, I have encountered a variety of approaches used by kennel owners ranging from the dog not being handled at all, to the dog being walked on the lead in adjacent fields or exercise spaces created for the dog. This is likely to be affected by the temperament of the dog in question and the reason for it being removed from the owner in the first place. Kennels have to maintain certain standards in terms of environment, diet, health and welfare and so your dog should remain healthy for the stay, but this does not readily account for the dog’s emotional wellbeing when apart from its normal home and the people it knows. 12. What happens during a dog behaviour assessment? The mechanics of a dog behaviour assessment vary between dangerous dog assessors, but fundamentally the dog assessor will be looking to evaluate the dog’s temperament using a range of techniques. My own approach is to reassure the dog, which is likely to already be in a state of stress (especially when in a kennelled environment). I spend as much time as possible to allow the dog to become used to my presence in a non-threatening manner to set the dog up for a successful assessment wherever possible. This helps me to see how the dog might be in a day-to-day living environment, whilst taking into account the circumstances around the dog behaviour assessment itself. Once I am satisfied that the dog is calm and relaxed in my company, I can then move to bring the dog out of its kennel space and into a secure space to carry out the dog behaviour assessment. Approach it free from aggressive responses as I place a slip lead over its head in the kennel. A dog that can then follow me (without barging or rudeness) into a more open space and not lunge at me or show aggressive behaviour towards me or others. A dog that will demonstrate a good number of passive ‘Calming Signals’ for example licking of the lips, yawning, looking away, sniffing the ground. Otherwise known as appeasement signals. A dog that can listen and respond to basic commands, such as the Sit, Down, Stay, short distance recalls. How the dog responds to sudden physical movements that I may exhibit, such as an abrupt stop and a clap of the hands. How the dog responds to a squeaky toy I might produce. Is the dog play driven, will it elicit a response that is excessively prey driven and will the dog release the item on command? I like to test a dog to ensure that it can walk past other people and in some cases other dogs at various distances to see how it responds. This particular element depends on the environment that I am carrying the dog behaviour assessment out in. I always prefer dog behaviour assessments in open public spaces, as we obtain a more genuine picture of the dogs’ behaviours as a result. The above list is by no means exhaustive, but it does begin to give a little more insight in answer to the question as to what is done during a dangerous dog assessment. This is how I do it and not following a set standard or format, which in itself does not exist. It is not ethically correct or even practical to recreate the exact circumstances of a dog attack event, but by using the above tests a dog behaviour assessor can assess various propensities/behaviours that the dog may exhibit in public.